There may be some issues with the texture .mod files. All three work fine on my end, so I'm not sure what's going on. If anyone has problems with the textures overwriting each other (science textures on the Ajax or vice versa) please let me know right away. In the meantime, if you are having issues I have a couple things that should get them to work. First, install your chosen science textures .mod, clear the job list, then install the Ajax textures .mod. I suspect they're just overwriting each other in Mod Maker. If that doesn't work, install your chosen science textures, clear the job list, then navigate to your BIOGame/CookedPCConsole folder and find BioH_Liara_00_NC.pcc. Copy that file to your desktop and install the Ajax textures. Put the copied BioH_Liara_00_NC.pcc back into your CookedPCConsole folder and let it overwrite. Run the TOCBin Updater and it should work. I'm actually having an issue somewhat like this. The default textures are being applied to the ajax mesh. It doesn't seem to affect any other textures. But it started happening after installing the ME3 Spectre Store. If you're still having difficulties, try installing the .tpf in the downloads, but be sure to follow the readme exactly! If it still doesn't work, try reinstalling me3explorer. Save only the me3tree.bin file in the exec folder and delete everything else, redownload the program from Sourceforge, replace the me3tree.bin file, then reinstall the mods. But may i ask you on how can i only install the Ajax armor without affecting the Casual outfit (not replacing the Lair of the Shadow Broker's outfit with the ME1 looking one)? If you're running the dlc version, just delete the BioH_Liara_00_NC.pcc from the dlc's CookedPCConsole folder and run ME3Explorer's AutoTOC utility on the dlc. If you're doing the .mod version, only run the Ajax .mod files and ignore the science uniform ones. She'll keep her lab coat on the Normandy and Citadel and wear the Ajax everywhere else. I was hoping there was a method for this, I have a different casual replacer and I'd love to use this mod alongside it. Thanks! Is this mod compatible with those that add many different outfit to Liara ? Did you test it with EGM ? Well, I'm "keeping the bull by his horns" and I installed it - Ajax plus helmet and causal - with the whole circus, and it seems it works fine. 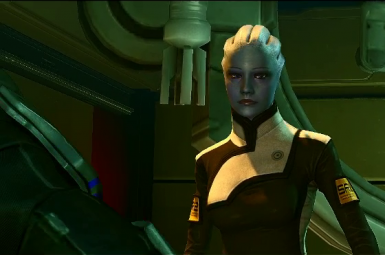 Let me make a little note more about Liara's black science outfit. 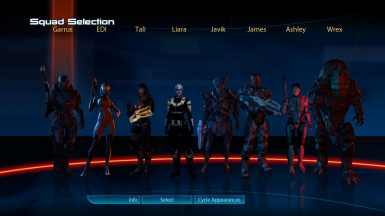 It is M A G N I F I C E N T.
At the end Liara now is a member of the crew, not in that RIDICULOUS tail-coat of hers. Thank you very much, I'm glad you enjoy it so! :D And yes, as you've discovered, the mod works beautifully with EGM and several other major mods, including BackOff. The only thing it won't be compatible with is anything else that changes her default outfit. If I wanted to use the new DLC version but only the casual outfit what files would I need to remove if I did not want to use the Ajax armor? In response to post #53724943.
ebg2465 wrote: If I wanted to use the new DLC version but only the casual outfit what files would I need to remove if I did not want to use the Ajax armor? You'll want to remove every .pcc file EXCEPT BioH_Liara_00_NC.pcc. Be sure to take out only the .pcc files and keep every other file type in there. Also don't forget to run ME3Explorer's AutoTOC on the game before you start it or it'll lock up. 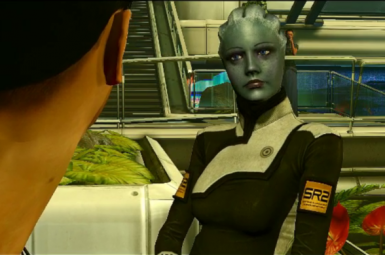 Does the TFC include a vanilla definition of Liara's face and skin? I have an HD tpf version of her skin, but when I use this DLC mod her skin looks like the lower definition vanilla. 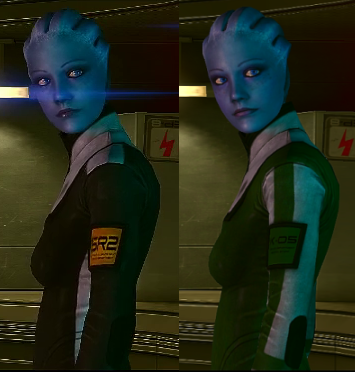 i saw on the casual liara replacer it replaced liara's dress in the citadel dlc. does this mod do the same? Hey there, princessdemeter. I wanted to report an issue with your mod... not quite sure what is causing it, but it might be a bad texture or something...heck, it might not be your mod at all. installing the DLC version and doing a treescan in ME3Explorer or scanning (or was it processing?) the textures in MEM causes both programs to hang and crash. Is it possible that you could get CaptainObviousau to look at it and see what's going on? I'm using the black scientist coat and the full helmet optionals files included just to be specific. I have also been having difficulties scanning the DLC version with the latest ME3Explorer and those very optional files, but they just don't scan. No crash. I'm afraid I haven't got a clue what could possibly be causing it, though. CaptainObviousau will have to look into it when he has a chance. Edit for CaptainObviousau's reference: Just attempted a scan to get the errors it's throwing at me. It appears it's not recognizing the Textures_DLC_CON file. Heya. I've got a log generated by MEM that describes the problem with your DLC and CaptainObviousau's Ashley Battlepack - Expanded DLC too. I'll post this on his mod page as well. Wow! A really great mod. Thanks so much for creating it and keeping it updated. I do have a question though. 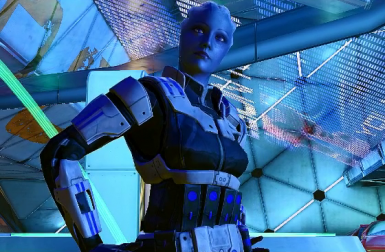 I want Liara's helmet to show up on all her armors, not just the Ajax. 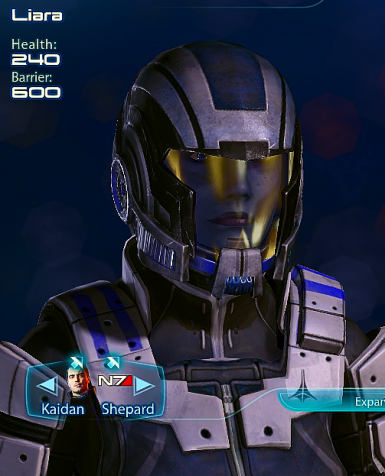 I installed the helmet only mod from Getorex as well at the Default Armor Replacer and her breather mask shows up on everything but the Ajax armor. If I remove the Ajax armor DLC then the helmet shows up on her default armor but not her From Ashes armor or her Alternate Armor. Any help would be much appreciated. Thanks again for a great mod! If you're using a DLC version, everything needed for her helmet is in the options folder. The 'Helmet Only' file is just for the folks who have the old .mod version and want the the new helmet When the DLC's installed, the helmet will only appear on her Ajax armor. None of the other armors are altered at all. 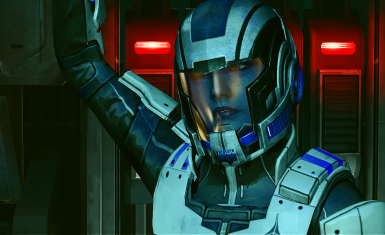 You'll want to pick up Getorex's DLC_CON_Geto01 mod here on the Nexus to get the helmet on all of her armors. It also adds the clear helmet to the rest of the squad, along with several other changes. To make the two mods compatible, you'll need to delete the BioH_Liara_00.pcc and BioH_Liara_00_Explore.pcc files from Getorex's mod and run an AutoTOC on it in ME3Explorer. And you're welcome! Hope you'll continue to enjoy it! Thank you for heads up! I really appreciate it! 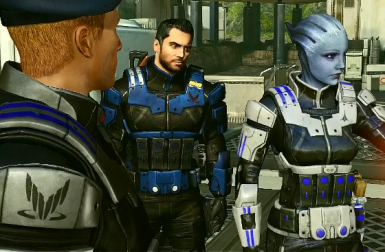 I've always wanted a mod that made Liara wear her science outfit while off-duty and this is the only one I found. There are some mods that replace her "casual" outfit but none use her science uniform. I even tried making the mod myself and failed horribly. But before I download I want to know if it's possible to just keep the casual outfit part of your mod and leave everything else untouched. If it's possible, how can I do it? Thanks. Absolutely! The .mod version keeps the armor and off-duty versions of her outfit completely separate. If you want to keep her in the default in the field but have her in the science outfit on the Normandy, just skip installing the Ajax mods. Be sure to use Rev 653 of ME3Explorer if you use the .mod version! For the DLC version, just delete every .pcc file in the DLC's CookedPCConsole folder except BioH_Liara_00_NC.pcc.